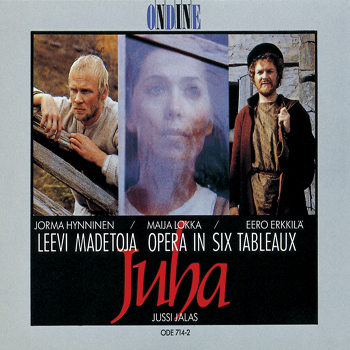 This double CD contains one of the great Finnish national operas, Juha, composed by Leevi Madetoja in 1934. The libretto by Aino Ackté and Leevi Madetoja is based on the novel of the same name by Juhani Aho. The realistic and psychological drama centres on a couple living in the eastern part of Finland, Juha and Marja, the latter of whom gets seduced by the wayfaring trader Shemeikka. The recording was originally produced by the Finnish Broadcasting Company, TV 1 in 1977. Ondine released this digital remix in 1988.